We’ve covered a lot of amazing gaming rigs here, especially during CES. But the truth is, a gaming rig is only as good as all the components, and you definitely want your storage working as hard as your gaming fingers. Western Digital knows you need the best, and they’re aiming for it with their new WD Black SN750 NVMe SSD. 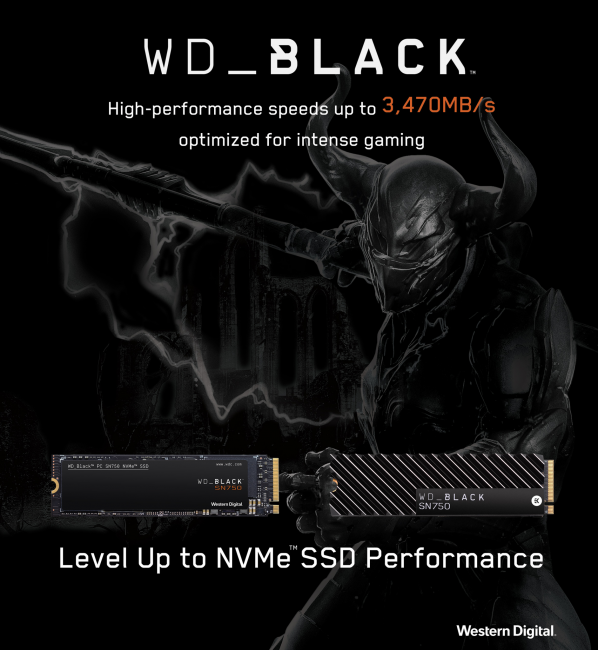 Western Digital is definitely aiming for the gaming market, and not just because their new drive has an impossibly long and vaguely threatening sounding name. The drive will be offered in everything from a (relatively puny) 250GB all the way up to 2TB, with pricing from $79.99 to $499.99. On top of that, you can pick one up with a heatsink, so the drive can run for longer without overheating, giving you that key advantage when playing Fortnite or whatever the kids play these days. Don’t look at me, my SNES classic is still a marvel of engineering to me. All jokes aside, the speed of the SSD plus the heatsink means the drive can read and write information faster. This translates to less lag time, more play time. And since WD knows gamers love to tweak, they’re including a special software dashboard that lets users control things like gaming mode to increase the peak run time and avoid low power mode. Anyone can control their graphics card and mouse speed, but you get to control your SSD too…don’t let the power go to your head. Unless you’re using a VR headset. If you’re building a gaming PC or looking to take your rig as far as you can, the WD Black SSD should be tops on your list. Look for it in Spring 2019.